‘When the legend becomes fact, print the legend.' So says reporter Maxwell Scott (Carleton Young) in 1962 western The Man Who Shot Liberty Valance, and it's advice that American writer-director Brian Helgeland (the Oscar-winning screenwriter of LA Confidential) has applied to his biopic of gangster twins Ronnie and Reggie Kray, who ran roughshod over London’s East End during the 50s and 60s. That it is based on the biography The Profession of Violence: The Rise and Fall of the Kray Twins by John Pearson – an author hired by the pair in 1967, who subsequently wrote three books on their exploits – may go some way to explaining the reverential tone of Helgeland’s approach. Both screenplay and camera often flinch from the worst of the violence, most notably of the domestic kind, and the fights we do see – including a transformative one between the two brothers – are often choreographed, bizarrely, to knockabout circus music. It could be that the film is deliberately intended as a snapshot of the Krays as they saw themselves, but putting such a sheen over their crimes still strikes an uncomfortable chord. 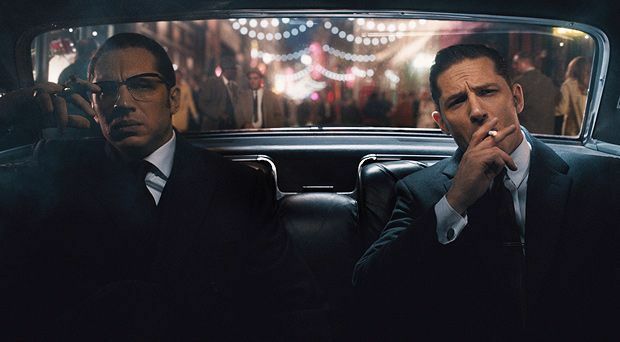 Narrative issues aside, Legend’s main point of interest is its casting of Tom Hardy as both brothers, a risk that pays dividends in terms of performance. While his portrayal of Ronnie borders on caricature, blurring the line between eccentric and psychopath, he is magnificent as the swaggering Reggie. And though the practicalities of putting Hardy’s two performances together on screen has resulted in some necessarily restricted camerawork, the editing is flawless. For all its technical and dramatic achievements, however, Legend has one insurmountable flaw: it’s just too glossy. The Krays were not a couple of ambitious businessmen forced to break a few rules, but ruthless, violent opportunists determined to get their way at any cost. Their story is not one of legend but notoriety – a distinction the film ignores to its ultimate cost. General release from Wed 9 Sep.
Biopic of East End gangsters Ronnie Kray (Hardy) and Reggie Kray (Hardy again), charting their rise and fall. Hardy puts in excellent work, especially as Reggie, but the overall tone is far too glossy and reverential, and both screenplay and camera flinch from the worst of the violence.